Why are people so hung up with the 100-point wine scale and the wine they are buying? Do you want to drink 100-point wines every day? Besides the possibility of prohibitive pricing, the wines may be 100-point rated, but may be recommended to age for another 5-10-20 years. Are you willing to wait that long? I have read somewhere that most wines that are purchased are consumed within a few hours of being purchased. Not that many people build big wine cellars in their homes. So I wondered, what are the popular wines being drunk in Canada and what are their 100 point rating? And does it matter that they are not in the “I only drink 90+ point wine” category? The Toronto Star in June 2017 posted an article online about 5 bestselling bottles in Ontario and the people that enjoy drinking them. Online I searched for each of these wines and their rating on the 100 point scale. I found that Wine Align had rated each of these wines. 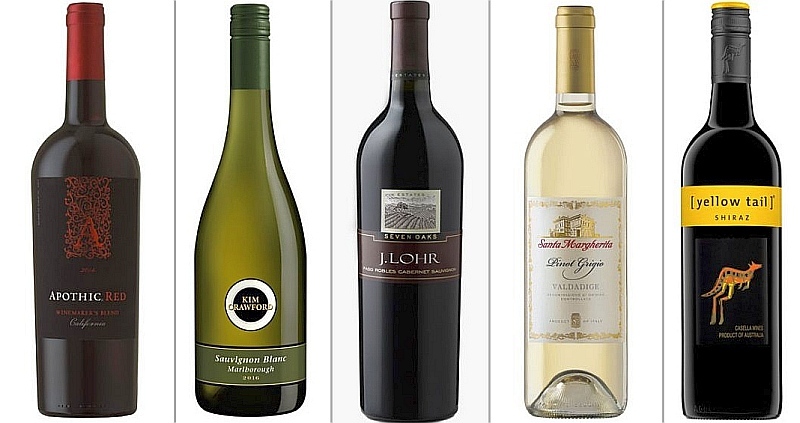 The average point rating then for these very popular wines in Ontario is 84.4. I would assume that other popular wines will not be too far off from this value. If someone told you that they bought you a wine that is 85 points, without telling or showing you what it is, would you enjoy it when you tasted it? Do you know how eRobertParker describes a 80-89 point wine? “An above average to very good wine displaying various degrees of finesse and flavour as well as character with no noticeable flaws.” I have also seen the 80-89 point range by Robert Parker described as “Above Average to Excellent“. Wine Align uses the Robert Parker rating scale, so Apothic Red can be described as having some degree of finesse and flavour, above average to excellent. With this information about the 100 point rating scale, would you still drink an 80-89 point wine? Should you consider other rating scales that are not 100 point, such as 5-star rating, or even Tre Bicchieri (3 Cups)? The Vivino website uses a 5 star rating. Here is Vivino’s Yellow Tail rating page. The BC Liquor stores website also uses a 5 star rating. Here is the BC Liquor Stores Yellow Tail rating page. In Italy, Gambero Rosso, a well-recognized food and wine magazine, rates Italian wines every year and gives the ones that reach a certain level of quality 1, 2, or 3 glasses (Tre Biccieri). They have a world tour each year, and I eagerly await it and the fantastic wines that they are pouring. Is having only 3 categories for these Italian wines a detriment? I don’t think so. I can’t imagine 99 Biccieri. Some websites don’t even give a wine a rating; rather they give a description of the wine which should help you decide if you would like to buy it, such as “Rich and Full” or “Aromatic and Supple“. The LCBO in Ontario, SAQ in Quebec, and Nova Scotia Liquor Control Board all use these descriptive tags. Here is SAQ’s page for Yellow Tail Shiraz. That being said, government liquor stores try to sell all wines, so it may make sense that they would not want to put ratings, and have people look to outside critics for their advice. But there are private websites that also rate with descriptions, rather than points. One that I enjoy is Wine Press Northwest. They use terms like “Excellent”, “Outstanding”, and “Recommended”. As an example, here is their recently reviewed Wind Rose Cellars Dolcetto 2014. Wines are meant to be enjoyed. Don’t be too consumed whether your wine is 90 or 95 points. Check other sites that describe the wine; its aromas and flavours. Is this a wine you would like to drink? Rating systems are guides only; some better than others. could you give us your 5 star ratings of these wines? Hi John. Without me tasting them, I cannot give a definitive 5-star rating. I don’t want to under-rate or over-rate a wine without tasting it.